I suppose it was bound to happen. School started back up. The week was a hectic one. He couldn’t find his favorite stuffed animal. And I had just set the timer for 5 minutes until bath time. “Time for bath! You can have playtime afterward,” I said lightly. And like a ticking time bomb, he exploded. My young son snapped over having to stop playing and head upstairs to the tub. What ensued was one of those dreaded hair-on-fire, smoke-out-of-the-ears, screaming, wailing, flopping-on-the-floor meltdowns complete with a “You’re so mean!” screamed from the upstairs landing. In our house, we call it a Category 5. I calmly walked down to the kitchen pretending to be non-plussed by the unfolding drama…and thankful for the fact that this was happening in our house and not the middle of Target. The theatrics continued in the upstairs hallway. At one point I made my way back up there and somehow actually got him in and out of the shower while the weeping and gnashing of teeth screeched on. “Take a deep breath. Peace, peace, peace”, I repeated quietly. He rolled his eyes at me in response and let out a big huff. Now I’ll be honest with you, the eye-roll response really gets under my skin. Everything within me wanted to put him in his place with a firm “mom look” and some choice words of reprimand. But I was tired. I was bewildered as to how our peaceful little evening had gone from bliss to chaos all because of personal hygiene. And somehow I just knew that wagging my finger would get us nowhere. Somewhere between apathy and “Crazy Mom,” the lightbulb went on inside my head. I could either scold him for all of the screaming and yelling capped off with a disrespectful eye-roll…or I could surprise him with grace. I could meet his anger with my own…or I could try to reflect God’s steady love toward him even when he’s being ugly. I took a deep breath…and sat down on the bathroom floor. 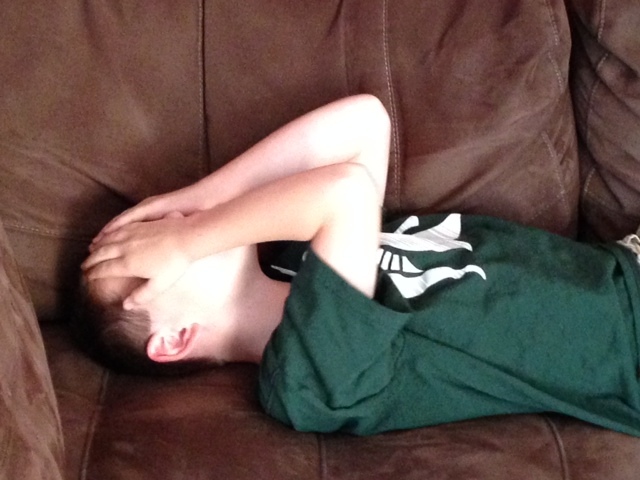 Mad, but exhausted, my little boy— still wet from his shower—crawled into my lap and laid there like a rag doll. He started to say something. I could tell he was revving up to mouth off a zinger. But he stopped short. He took a breath. He laid there in my arms, closed his eyes, and let out a exhausted sigh. Sometimes we’re so full of burdens that it all comes out sideways. Sometimes the week is hectic and the day is long, and you can’t find your favorite stuffed animal and you’re sick of being told what to do, and when and how to do it. Sometimes we all get to the end of our rope, and we just need to rage on for a bit…without risk of getting in trouble, or receiving a consequence, or being subjected to a “teaching moment.” Sometimes the only answer is to crawl into loving arms, unload, and cry it out. In the aftermath of the Category 5, my son suddenly opened his eyes and declared, “It’s over and done with.” And just as quickly as it all began, he got up and skipped downstairs to join the rest of the family in a few rousing games of Old Maid. Go figure! Did he walk away consciously aware of God’s love and grace? Probably not. Did he walk away thinking about Jesus? Doubtful. But the laughter and silliness as we played cards, the prayer of thanks and the squeeze-hugs before bed, let me know without a doubt that the Good News had been received: even when we are at our ugliest, God pours out grace upon grace, peace upon peace, and let’s us cry it out in the safety of His embrace. Almost makes that Category 5 worth it. Almost. I’m so glad it spoke to your heart. I love this image, of you choosing to be a bringer of grace, hard as it is in the middle of the meltdown. It’s fun to think about meltdowns as occasions for grace — whether it’s a small child or an adult church member. Same process! Thanks, Kelly!